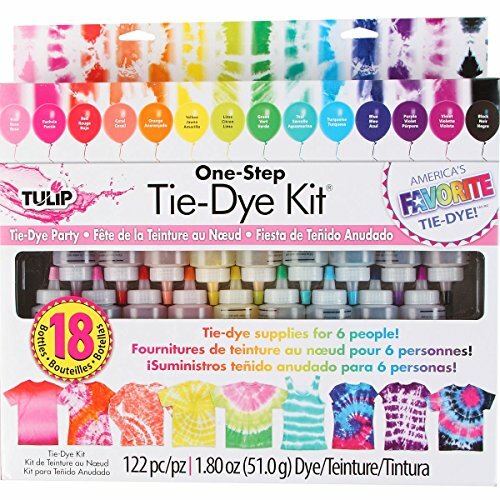 The Tulip One-Step 18-Color Tie-Dye Kit includes all of the tie-dye supplies you need to make your party for six pop with over-the-top color and creativity! Stocked with 18 bottles of vibrant One-Step Dye, supplies and an inspiration guide, this kit gives your six tie-dye partygoers easy access to tons of tie-dye fun. Includes everything you need except the T-shirts! Tulip® Fashion Art has made the fabric dying experience even easier and less messy with Tulip® Tie Dye Tools. Creativity always needs a good tool - and fabric dying is no exception. Count on the variety of Tulip Tie Dye Tools to make your current fabric dye project quick, easy and mess-free! If you have any questions about this product by Tulip, contact us by completing and submitting the form below. If you are looking for a specif part number, please include it with your message.